This pie crust will work for any pie and it’s quite easy to make. If you only need one pie crust, freeze half of the dough, and use later. 1. In a large bowl combine flour and salt. Cut in shortening until mixture resembles coarse crumbs. Stir in water until mixture forms a ball. Divide dough in half, and shape into balls. Wrap in plastic and refrigerate for 4 hours or overnight. 2. 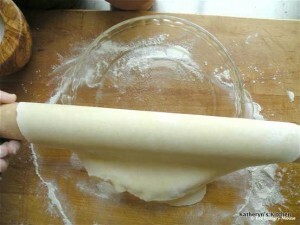 Roll out dough on a floured counter to about 10 inches in diameter. Don’t over work it. 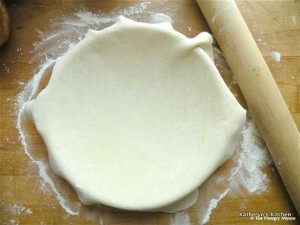 Place in pie plate and put in place. 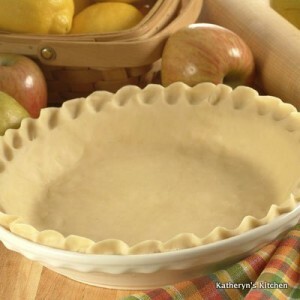 Now cut off any extra dough around the edges of the pie plate. 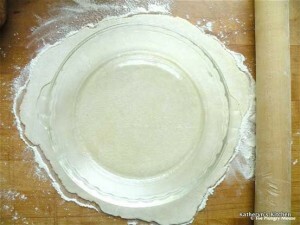 Now use your fingers to pinch the dough around the edges of the pie plate, like the top photo. It is ready to use.